Make no mistake, guys: they'll be looking at you, too. 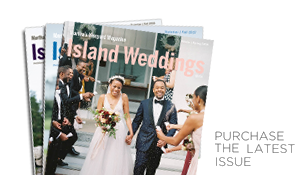 I’ve got a secret for you: weddings are a lot more about pictures than nuptials – and your wedding pictures will outlive you. That’s why your fiancée cares so much about the flowers and the tablesettings. The choices you make for your wedding live on. Now, no one is saying you need to stress about choosing the flatware or napkin color, but there is one aspect of wedding preparation you need to take control of: your look. Yes, your bride will be beautiful in a dress that costs a fortune and took months to select. But don’t believe no one’s going to be looking at you. You’re going to be judged on several levels: are you cute, handsome, or hot (depending on the ages of the ladies in attendance), and cool, classy, or not (by the guys). If you don’t take an active role in determining your style, chances are the bride or her mom (or your mom) will have a say in what you wear – which negatively impacts on your boys in the wedding party, especially the best man. Don’t worry; looking your best on your wedding day is easier than you think. First, flip through old photographs of your dad/uncle/granddad’s wedding, paying special attention to those that have a "Wow" factor – as in, “Wow what was he wearing?” Let that serve as your reminder: do not dress in the styles of the day. That means no wide lapels, pants too short/long/tight, shirts with long/no collars and/or ruffles. You’ve seen wedding pictures of a guy wearing a satiny purple suit not even suitable for a prom, right? Don’t be that guy. Next, figure out how you do want to look. You were probably smart enough to learn about a diamond’s clarity, cut, and color (the most important things besides the size) when selecting your fiancée’s engagement ring. The same components (plus a few others) apply to what you should wear. Keep the following simple rules in mind to dress for success. Start with selecting a timeless look. Think Bond, James Bond. Seven actors have played Bond in twenty-six movies since 1962, a fifty-six-year run during which our hero’s clothing has never gone out of style. The too short, too tight (too expensive!) suits and jackets in today’s stylish men’s magazines? Nuh-uh; remember your dad’s wedding picture. Your pants should cover the tops of your shoes; the jacket sleeve should reach the top of the soft part of your thumb; and the shirt cuff should extend a half inch longer. You should be able to cup the bottom of the jacket in your hand. That's a look that's not going out of style. Pay attention to the fabric; you may be tempted by a pretty cotton, linen, or seersucker suit if your celebration is scheduled for summer. Before you make a purchase, ball up the suit’s sleeve in your hand and release it. If it stays wrinkled, don’t buy it. From the walk down the aisle to the honeymoon, there may be six or more hours of walking, sitting, eating, kneeling, standing, and dancing that will leave you looking like a gym rat, wrinkled and befuddled in the thousands of pictures of the bride, many of which will include you. By the way, remember to dance with the new mom-in-law in your comfortable, well-fitting suit – and leave the jacket on! You can’t rent a ring; don’t rent a tuxedo either. If you decide to wear one, have it made by a tailor – the day will come (if you stay in shape) when you can repurpose it for another event. If you choose a store-bought, high-quality suit, take it to a tailor so that it looks like it was made for you. If you can afford it, skip the store and have it made – along with your shirt. Bespoke refers to custom-made clothing; think of that in terms of how folks will be speaking about how you looked at the wedding. In a high-quality men’s store, ask about fresco wool, derived from the Italian word al fresco, for open air. It’s a fabric made from multiple yarns that make it airy but durable, designed specifically for summer, elegant and refined. For the other three seasons the rule is simple: the fabric should come from an animal, not a factory (no “polys”). Generally wool, mohair, cashmere, alpaca, silk, or, best, a silk blend are favored. Select quality fabrics that are Super 120s (Google it) or ask the person in the store. Yes, it’s more costly; it’s an investment. White goes with anything, but you’ll want a contrast from the typically white bridal gown if you’re considering wearing a white suit. Consider “winter white” instead. Even better: opt for something neutral like gray, charcoal, modest blues, or tan to khaki, so your groomsmen won’t hate you for not choosing a selection they can wear again. In a perfect world their suits will color-coordinate with yours. If not, consider separates like neutral slacks and a darker sport coat. The groomsmen will certainly appreciate two pieces that can also be worn during the day-after activities. Those jackets won’t be needed later on the Vineyard, but the neutral slacks saves on packing. For individual touches to accent your personality, go for a bow tie – but only if you can tie it yourself. Authenticity counts when posterity is on the line. The same goes for suspenders, which should button on the inside of your trousers. A colorful pocket square or a whimsical knit or seersucker tie to brighten your look would be welcome – especially if they match your bride’s bouquet. French cuffs with nice cufflinks amps up the look – and matching sets of cufflinks will make for great groomsmen’s gifts. Shoes? 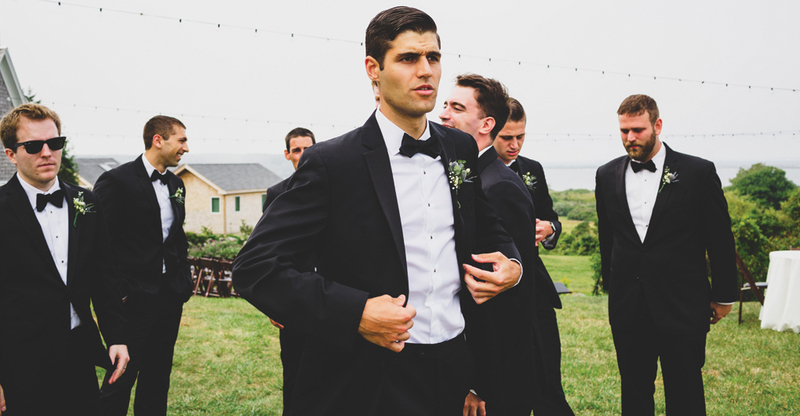 A high-quality suit gives you lots of options, especially for a Vineyard wedding. A pair of thin-soled, highly polished Salvatore Ferragamo’s is classy. Rocking brand-new white (leather, not canvas) low-cut Converse Chuck Taylors could be cute, and rolled-up pant legs with bare feet (if venue appropriate, like a beach) is going to look hot to someone. Sharing your newfound fabric, tailoring, and coordinating ideas in advance will allow you to brag that you dressed yourself when you receive all the compliments that are sure to follow. But dude, be worthy – don’t expect the last word; dress like the bride (and the mom) wants. The secret’s no longer new: happy wife, happy life. Photos of Stephen Schroeder and Katie Nitti by Cassie Castellaw. Stephen and Katie were married September 10, 2016 at the Tower House in Chilmark. Stephen wore a Proper Cloth shirt with a diamond jacquard weave and a bow tie by the Tie Bar. His suit was tailored by F&R Bespoke Tailors in Manhattan. These are tips for guys - a well fitted suit and shirt go a long way. Thanks for sharing! Steve and Katie both looked incredible on their wedding day!